Each city hosts elaborately designed medieval and modern palaces, cobbled alleyways, museum etc. The meticulously decorated palaces and temples, murals, Pauba art, stone and bronze statues, wooden struts count among finest specimens of Nepalese art and architecture in the world. Located in central Nepal, Kathmandu Valley today comprises of three major cities, namely Kathmandu, Patan, and Bhaktapur. Kathmandu (1300m) in particular is the capital of Nepal and is regarded as the social, political, economic and cultural center. Nepal's parliament- the seat of government- and all the ministries are located in Kathmandu. Bhaktapur is known as the city of devotees and Patan, the city of fine art. The valley has a long history of kings stretching as a far back as 300BC and is a cradle for Buddhist and Hindu faith for centuries. All three cities are intricately linked both physically and culturally. Each city hosts elaborately designed medieval and modern palaces, cobbled alleyways, museum etc. The meticulously decorated palaces and temples, murals, Pauba art, stone and bronze statues, wooden struts count among finest specimens of Nepalese art and architecture in the world. The ethnic Newars considered the original inhabitants of Kathmandu Valley still practice their superb skills and craftsmanship. Furthermore, the Valley comes alive every day with its colorful cultural and religious festivals that are observed throughout the year. The only living goddess in the world, Kumari lives in Kathmandu Durbar Square. For its profusely rich cultural heritage and unparalleled artistic achievement, Kathmandu Valley has was recognized as a World Heritage Site in 1979. A total of eight monuments spread within 20 km radius of Kathmandu Valley have been placed in the world heritage list, namely Kathmandu Durbar Square, Patan Durbar Square, Bhaktapur Durbar Square, Changu Narayan, Pashupatinath, Swoyambunath and Boudhanath. Moreover, there are numerous other monuments and temples that are equally enchanting in the Kathmandu valley. 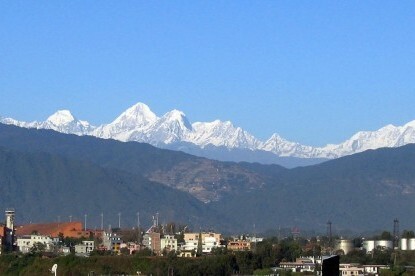 Kathmandu Valley is a traveler's paradise. Tribhuvan International Airport, Nepal's only international airport is situated in the capital city of Kathmandu. Kathmandu hosts some of the best five star and boutique hotels and restaurants in South Asia which offers traditional Nepali food to continental and Asian food. And don't forget to visit the cosmopolitan Thamel, a major tourist hub of Nepal. Surrounding Kathmandu Valley is beautiful hill stations such as Nagarkot, Chobar, Sundarijal, Nagarjun and Pulchowki which provides plenty of activities for adventure and beautiful views of the Himalayan peaks. Trekking, mountain biking, bird watching, rafting, boating, are some of the activities you can carry out in and around Kathmandu Valley.